I admit it: I expected House Republicans to reject the last-minute Biden/McConnell deal (that passed the Senate 89-8) and send us over the fiscal cliff. Instead, they did one of those having-it-both-ways things that makes people despise politicians: Within their own caucus, Republicans voted to let the bill come to the floor, where (led by House Majority Leader Eric Cantor) most of them voted against it. So they knew it was necessary and wanted it to pass, but they also wanted to be able to deny supporting it. The chart on the right has way too much jargon, but it’s showing debt-as-a-percentage-of-GDP over time under various scenarios. The top line is roughly cancel-the-fiscal-cliff-and-let-things-go-on-as-they-were and the bottom is go-over-the-cliff. 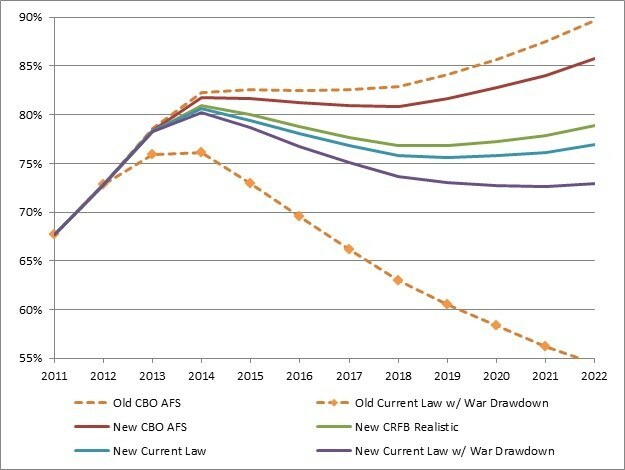 The red, green, blue, and purple lines are where we’re headed now under various scenarios. So who won? Nobody yet. This deal solved the question of the Bush tax cuts, but it delayed the spending-cut decisions until March, when they will run up against another debt-ceiling showdown. the major fight at the heart of this whole mess — over the proper scope and role of the safety net of the 21st century, and who will pay for it — remains unresolved. Only the outcome of that battle can settle the question of whether today’s compromise was a good one for liberals. Whatever argument we’re going to have, it shouldn’t be whether this deal is good or bad. It’s over whether Obama will eventually cave or not. I think this is a necessary and (eventually) inevitable confrontation. For that reason, I’ve soured on tricks like the trillion-dollar coin to finesse around the debt ceiling. Kevin Drum explains how that trick distorts the intention of the law, and so puts Obama in the position of trying to pull something rather than calling the Republicans on pulling something. I don’t want him to sacrifice his integrity to avoid paying blackmail; that’s just another kind of blackmail payment. The coming deadlines will be the next flashpoints in our ongoing fight to bring fiscal sanity to Washington. It may be necessary to partially shut down the government in order to secure the long-term fiscal well being of our country, rather than plod along the path of Greece, Italy and Spain. President Obama needs to take note of this reality and put forward a plan to avoid it immediately. A temporary disruption because we have to furlough the workers at the Department of Education, or close down some national parks, or not cut the grass on the Mall, that’s not optimal, it’s disruptive, but it’s a hell of a lot better than the path that we’re on. The problem is temporary and minor only if you assume that Obama quickly folds once he discovers that Republicans are serious. But what if Obama is serious too? The 14th Amendment (section 4) requires that the government keep paying interest on its debt and principle on bonds as they come due. But how long before we have to shut down the National Weather Service or the Center for Disease Control or the TSA? The whole thing reminds me of the great moment in “Blazing Saddles” when Sheriff Bart takes himself hostage by pointing a gun at his own head. The simple townsfolk of Rock Ridge were dumb enough to fall for it. Are we? The facts are pretty clear. Spending isn’t our big problem. The recession spike of 2008 aside, it’s about the same as it was 30 years ago. But instead of paying for that spending, we’ve repeatedly cut taxes, which are now at their lowest level in half a century. You’ll see an early sign of who’s going to win in how the mainstream media identifies the hostage in this crisis. If the hostage is “government” — a separate entity unrelated to the rest of us — then the Tea Party will win. If the hostage is “the country” or “the economy”, then Obama will win. Someone (Slate?) pointed out that under the Impoundment Control Act of 1974, the president is required to spend appropriated money unless he goes through a cumbersome recission approval process that’s never been used. So if we hit the debt ceiling and he doesn’t pay someone, they will go to court and demand payment, pointing out that the trillion dollar coin allows him to do so while following all current law.